Total refined product stocks at the UAE port of Fujairah stood at 15.09 million barrels in the week to November 13, down 0.9% week on week, according to data from the Fujairah Energy Data Committee (FEDCom). 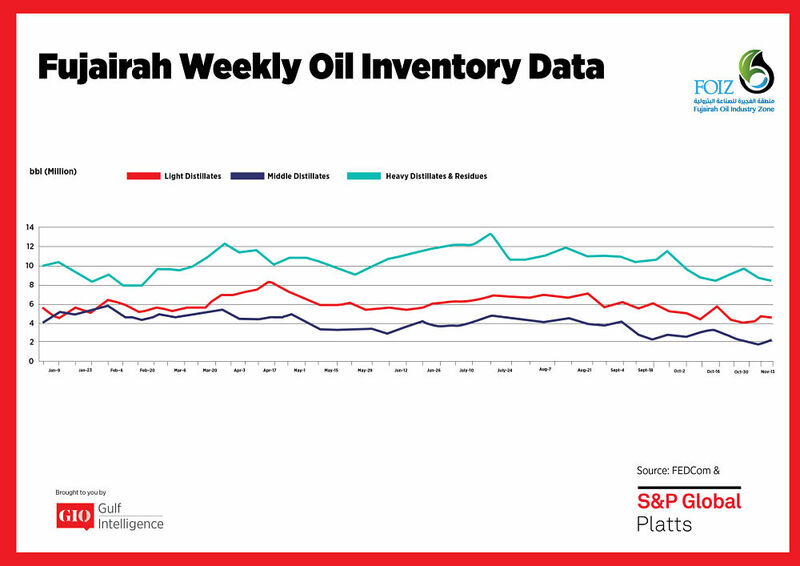 Total stock levels fell to a new record low for a third week in a row, about 23% lower than the average of 19.6 million barrels seen since the beginning of the year, S&P Global Platts Analytics said in a report. Stocks of light distillates fell by 4% week on week to 4.649 million barrels. 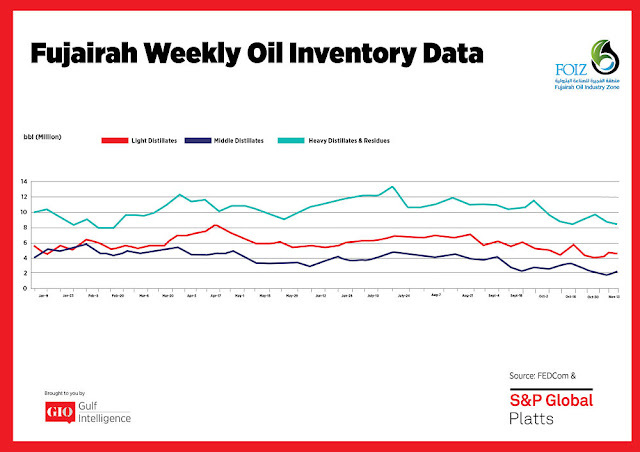 Healthy demand in the East of Suez continues to draw barrels from Europe, according to Platts Analytics. Stocks of middle distillates rebounded from last week's record low, rising 21.6% week on week to 2.121 million barrels. However, European gasoline supply to the Middle East may tighten as the trans-Atlantic arbitrage to the US is resuming. This would suggest the Middle East will need to draw additional Asian barrels to meet demand, the report said. The front-month time spread for Arab Gulf Gasoil has been in a contango since the beginning of the month and was at minus $1.36/b Tuesday, according to Platts data. 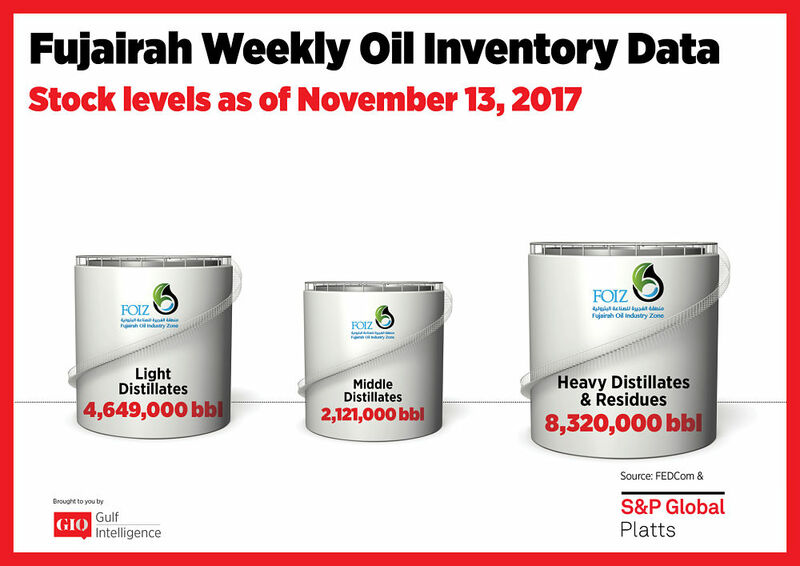 Additional tenders for December-loading gasoil and jet fuel from Bahrain's Bapco, Egypt's Midor and India's Essar Oil have emerged over the past two weeks, underscoring the excess of supply in the market. Stocks of heavy distillates and residues fell 3.7% to 8.32 million barrels and remain at the lowest levels recorded since February, FEDCom data showed. The Gulf Intelligence is a strategic communications & research firm effective across the full value-chain of the Middle East Energy Sector – we facilitate knowledge exchange and advance the business interests of national and international stakeholders operational in the regional industry.